The Beaver and Clay Campbell Productions are thrilled to bring you an Elvis tribute show like no other! 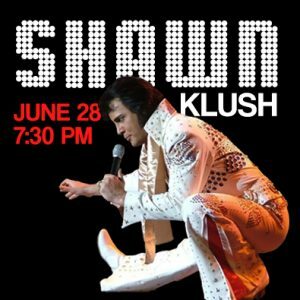 Friday, June 28th, don’t miss Shawn Klush at SkyPAC… the closest thing to seeing The King in concert. Shawn Klush was the winner of BBC-TV’s “World’s Greatest Elvis”, and was named the first ever “Ultimate Elvis” by Elvis Presley Enterprises. Along with special guest Cody Slaughter, this will definitely be a must-see show for any Elvis fan. Tickets are on sale now at the SKyPAC ticket office, online at www.theskypac.com, and by phone at 270-904-1880. Don’t miss the ultimate tribute to The King with Shawn Klush and Cody Slaughter, June 28th at SKyPAC in Bowling Green. Presented by the Beaver 96.7!